Single-processor engines are a thing of the past � that\'s why the new Fritz comes as a powerful multi-processor version right from the word go. Deep Fritz 14 features a 64-bit engine, and can support up to eight processor cores simultaneously. That\'s where the similarities end, however, as the engine itself has been completely redesigned and packs almost 100 Elo points more than the previous version, putting Deep Fritz 14 amongst the strongest chess programs in the world. 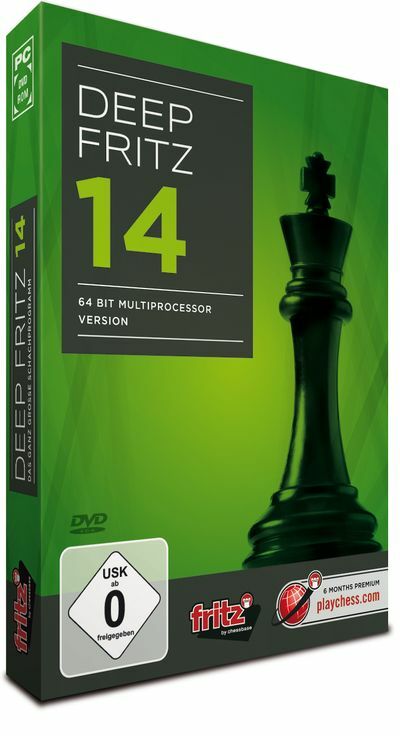 Optimized for Windows 8.1: With its novel 64-bit program interface, Deep Fritz 14 runs faster and flows better on the latest versions of Windows. Naturally, the new version retains all of the well-known playing, training and analysis functions that made Fritz the most popular chess program in the world. Go Premium: Log on to the Playchess.com server with Deep Fritz 14 and tune in to exciting live commentary of world-class tournaments, or take part in training sessions with frontrunner coaches such as Grandmaster Daniel King, Klaus Bischoff, Maurice Ashley, Dr. Karsten M�ller and many more. Deep Fritz 14 includes a free six-month Premium Membership to Playchess.com. Only the best is good enough. Deep Fritz 14 gives you access to �Let\'s Check�*, the world\'s largest database packed with high-quality analysis. Over 200 million positions annotated with deep engine calculations are saved on the Let\'s Check server, with more being added every day. If you want to know what to think of a particular opening position, take a look on Let\'s Check and find out in seconds what it would take your PC hours to Uncover.